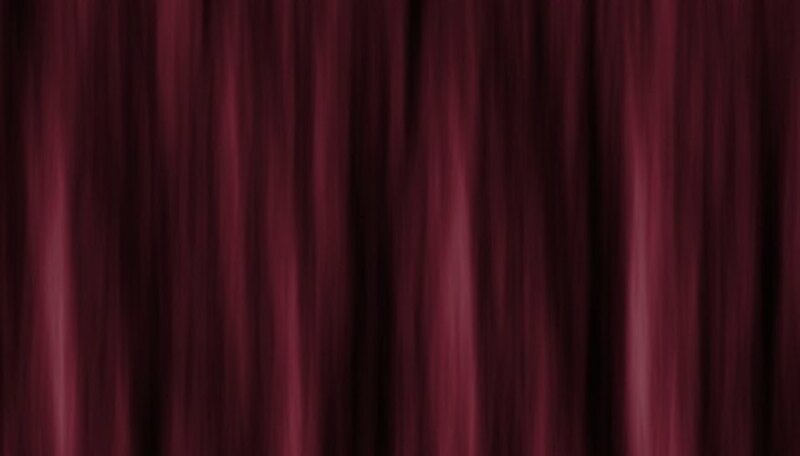 The allure of the stage is due in part to the stage curtain. The entertainment that lies beyond that fabric sparks excitement in the audience. A smooth curtain opening accomplished by the puppet master sets the stage for a great performance. By using a non-fray fabric such as wool felt, the tedious hemming of the curtain is eliminated. The traverse curtain rod utilizes a pulley system for opening and closing the curtain. Measure the width of the stage opening of the puppet theater and double it. Measure the length from the top of the stage to the stage floor. Use these measurements to determine the fabric yardage and the size of the traverse curtain rod. Cut the fabric. Pin the pleating tape to the top of the curtain on the wrong side of the curtain fabric. Sew the tape to the curtain with a straight stitch 1/4-inch away from each long edge of the pleating tape, traveling in the same direction with both lines of stitching. Sew a line of stitching between each cord on the tape. Pull the cords on the pleating tape to create the pleats. Knot the cords to secure the pleats. Insert the drapery pins in the pleats with the hook side outward to fit in the traverse rod openings. Install the traverse rod, following the manufacture’s directions, above the puppet stage. Insert the drapery pins in the rod openings. Paint the outside of the traverse rod black.